Later in a conversation with the disciples explained the parable of the Sower. Have you ever noticed something strange about the parable of the Sower or the parable of the Farmer as some versions read? It starts off with, “A Sower went out to sow,” which is probably why we call it the parable of the Sower. However, later when Jesus tells the disciples the meaning of the parable it is no longer about the Sower it about whether the seeds grow or not. I would like for us to take another look at another meaning of the parable hidden below the surface may. Let’s take a look at what the parable has to say about what God wants to plant in our lives. First of all did you catch how reckless the Sower in the parable was? 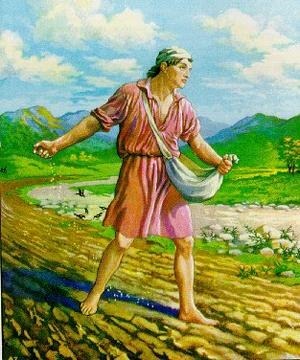 According to Jesus’ story the farmer grabbed a hand full of seeds and began throwing them willy-nilly to wherever they land. How many of us who plant a garden or flowers do not first go out and prepare the ground yet the Sower in Jesus’ story did nothing to the ground nor did he have a specific area picked out? I remember many years ago when Patti and I lived on Velma Drive after I nearly killed myself trying to spade up a garden spot in our backyard my grandfather brought his rotor tiller to our house and cleared out a good size garden area in no time. If my memory serves me right the plants did not grow well in spite of how rich the soil appeared to be. Telling me there is more to preparing the soil and growing a garden than just tilling up the soil. Like testing the soil then adding the necessary “stuff” to help the seeds germinate and grow to maturity. Yet in Jesus’ story no soil preparations are made and the seeds fall on unprepared soil. Let’s think about how that can relate to our lives today. First of all it will help if we can identify the Sower/Farmer. We could say the church is the farmer because God commands the church to plant seeds of faith in the entire world. And since we are members of the church and called to do likewise the image of being the farmer can extend to us as well. Each of them reveals a great deal about God. Included in that is the fact that God comes to us where we are. They also suggest and illustrate the type of ground our lives may represent does not stop God from seeding our lives. While the condition of our lives is important what is more important are the seeds God is wanting to plant in us. But before he can plant his seeds in us he must first have our attention as suggested in the parable of the Prodigal Son. Even though the parable makes no reference to God helping the prodigal son “come to himself” that is not true with me. I don’t know about you but sometimes God has some pretty unique methods of getting my attention. Once God has our attention he can then begin doing his most important work in us planting not only the seeds we need to be imitators’ of Jesus but also so we can mature spiritually and fruitful. When Paul was writing his list I believe the first three he did not list randomly and that may not be true with the remaining ones. I believe Love is the first seed because it is love that makes it possible for the other seeds to take root, germinate, ripen, and become fruit for others including ourselves. I am learning every day that one of loves greatest foes is blaming when we begin playing the blame game it becomes impossible for us to love whoever or whatever we are blaming. And that applies to all of our relationships especially our relationship with our self. After Love comes Joy. There are times when I think peace should have come second but we need to hear and understand that how we define peace and joy is not the peace and joy God is wanting to give us. For the most part we understand peace and joy from an emotional standpoint, but they are seeds of God therefore they are spiritual and not emotional. While it is true they may manifest themselves from time to time as emotional but they go far beyond just emotions that make us feel better. I understand Joy as the ability to celebrate and enjoy life under all circumstances especially when life is at its darkest and weakest and it is God that transforms the impossible to reality by giving us his Joy. Speaking from experience without “the Joy of the Lord” that is impossible. I also believe it is the Joy of the Lord that transforms some of what first appears to be “bad things” into good things. For example when I was first told I would need heart bypass surgery that was a bad thing yet when my doctor told me without it I would not have survived my November heart attack the Joy of the Lord tuned my bypass surgery into a good thing. And suddenly I found myself at Peace not only with the surgery but also with the heart attack and my sudden change in life style. I am convinced that one of the most important “ingredients” of Peace is the Joy of the Lord which is why Peace comes third rather than second. Peace is not the absence of conflict, nor is it feelings of euphoria in response to a job well done! – Peace is active presence of Jesus! Perhaps the best way of knowing the true Peace of Jesus is by experience rather than just studying about it from a book. I found this short testimony a couple of days ago and as I read it even though the circumstances were different for me I felt as if it was my story and I experienced the Peace of Jesus as I so often have. As you read this “hearing” it is my prayer that it may remind you of your experiences with Peace at the hands of Jesus. Where does one find God in the midst of economic downturn and unanticipated change? Even in the midst of sadness, anger, and disbelief, I see God everywhere! I know the face of God in unimaginable kindness from coworkers, numerous suggestions for job leads, two unsolicited offers for career coaching, and countless invitations to lunch. Clearly, there is something more at work here. As important as Love, Joy, Peace and the rest of the God Seeds are every one of them and even life itself is totally dependent on God’s presence through the Holy Spirit in us. You’ve heard me say this before and you’ll no doubt hear me say it again – The most important relationship in your life is your relationship with God! Not only that but you cannot have a real relationship with God without first having a relationship with Jesus! Jesus speaking about the importance of entering the Kingdom of Heaven “spills over” into the importance of our relationship first to him then to God. If that verse is not familiar to you then perhaps you’ll recognize it in this verse.